Set the oven rack to the highest position, and turn on the oven to broil on high. Line a rimmed cookie sheet with foil. Place the salmon spaced evenly on the sheet. Cook the salmon under the broiler for 5 minutes. 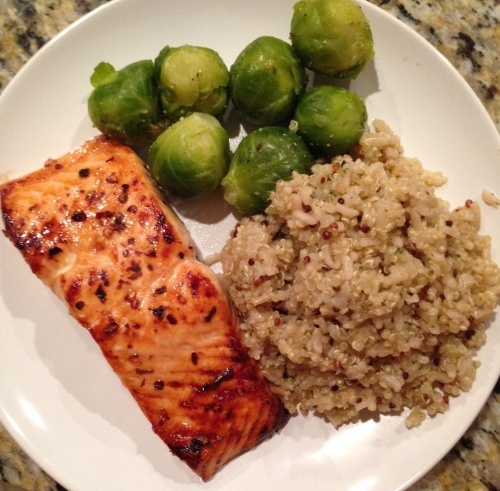 While the salmon is cooking, combine the honey, soy sauce, and red pepper flakes. When the salmon is done, remove from the oven—but leave the oven on broil. Coat each salmon fillet generously with the glaze. Put back in the oven for another 3 minutes to finish cooking. Watch carefully, as there is a fine line between golden salmon and burnt salmon. If it makes you feel better, you can bump the rack one down after you glaze the salmon.